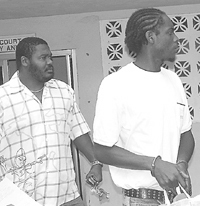 Dyerâs conflict with the law stems from the death of 36-year-old Raphael Trimingham who succumbed to bullet injuries received at a gathering in Chateaubelair in the early hours of Monday, 4th October. Senior Magistrate Simone Churaman took the cue from Prosecutor Sergeant Adolphus Delpesche in opting for the PI date. Former Crown Counsel Jaundy Martin, on behalf of the law firm Marks and Martin, represented Dyer.